Two applied methods of seed dormancy breakage of Taxus baccata from mature seed via embryo culture are described. Plant regeneration were obtained by culturing zygotic embryo on MS medium supplemented with 100 mg LG1 casein hydrolysate, 1 g LG1 Yeast extracts, 100 mg LG1 Ascorbic Acid and 5 g LG1 Activated charcoal with pretreatment of 2 weeks seed leaching in running tap water. Another putative plantlet were obtained with one month seed prechilling following embryo culture to WP mineral medium supplemented with B5 vitamins and 5 g LG1 activated charcoal. Development of bipolar structures with recognizable shoot and root apices was observed in embryo culture. Twenty percent of somatic embryos were regenerated in plantlets. Evergreen slow growing species of Taxus baccata lightly distributed as alive heritage in north of Iran, in Afratakhteh, Yakhkesh, Lafoor of Savadkoh. Often with rounded or pyramidal canopy, bark reddish brown, thin scaly, branches long not whorled twigs green and irregularly alternate. Non resinous gymnosperms that up to 20-28 m, grow primarily in the understory of moist, forested habitats in temperate climates. Many trees are giant with a Diameter at Breast Height (DBH) greater than 100 cm and estimated age of more than 1000 years (Mosadegh, 2004). Interest in the culture of this and other taxus species has intensified with the discovery of Taxol is one of the most complex natural anticancer agents that were approved for drug refractory ovarian and breast cancers and shows promise against some other cancers and malaria (Son, 2000; Mihaljevic, 2002; Majeda, 2000). Yew is now catalogued as a rare and endangered species prone to extinction and locally extinct or reduced to small isolated populations in Iran (Mosaddegh, 2004; Habibi Kaseb and Lesani, 1984). A number of causes for decline of yew variably attributed to climate change, Herbivory of seeds or seedlings. Heavy grazing by deer, fungal disease and second major contributor to decline has been excessive felling (Mosaddegh, 2004). The challenges, however, have been in propagation rooting stem cutting of the old trees, which sometimes take up to one years and poor initial growth performance of the rooted cutting (Gibson, 1993) using traditional vegetative propagation method (Chang et al., 2001; Ho, 2001; Naraghi, 2002). But seed natural germination usually does not used until the second spring after seed fall. This means that yew seed have a strong and variability dormancy period of 1.5-2 years (Chee, 1995b). Since, germination of mature seeds required a series of treatment. One recommendation is to hold the seeds for 150 to 210 days at 16 to 18°C, therefore 60 to 120 days at 2 to 5°C (Heit, 1968). The ISIA rules specify prechilling yew seeds for 200 days at 3 to 5°C. Several method of in vivo culture has been reported for some Taxus species. Somatic embryo culture would be recognized a useful tool for overcome seed dormancy and to abbreviate the breeding cycle (Ho, 1987; Chee, 1996) and immature embryo cultures were carried out in T. brevifolia, T. cuspidata, T. media and T. baccata. The fraction of seedling formation from immature embryos, however, was 15 to 40% (Flores and Sgrignoli, 1991). Mature cultures were difficult to develop in seedlings stages (Flores and Sgrignoli, 1991) and many treatments require to increase germination such as: GA3, Thiamine and Tobacco, Casein hydrolysate, PVP, aspartic acid and prolin added in the culture medium. A 14 h photoperiod during incubation and initial four week of culture in darkness were reported to improve embryo germination and growth in the seedling stages of yew (Ho, 1987; Chee, 1994). However, the supplementation of basal media with Kinetin, thidiazur on 6-benzyl aminopurine or GA3 had no effect on the germination of the embryos (Data and Jha, 2004). In vitro propagation the different genotypes would yield plants suited for programmes of conservation of natural genetic resources (Rongsen, 2004; Ho, 2001). Thereby, safe guarding yew survival is needed (Majeda, 2000). The objective of our study was to catch applied method in order to overcome seed dormancy and produce plantlet formation by embryo culture that could be the way of rapid propagation and facilitated for conservation planting and taxol production (Enaksha, 1993). Seed material: Seed of experiment collected from Yakhkesh forest in north of Iran at autumn. Seeds were selected in 3 stages that included: 1) immature seed up to 2 mm, green Aril and stiff, 2) mature seeds up to 4 mm with orange Aril and 3) mature seeds up to 6 mm, brown color, reddish Aril, between immature and mature seed. After removing Aril, weighty seeds are recognized with soaking in water. Then, seeds divided to some parcels and followed with determining numbers and average of seeds for comparison. Pretreatment and sterilization method: Yew seeds present a lengthy dormancy period. In order to assay seed mantle and resistance, various pretreatment carried out included: 1) several seed treatment rinsed in boiling water for 5 and 10 min, 2) seed treatment with soaked in concentrated HCl for 30 and 60 min, 3) cold incubation in 0°C in refrigerator for 2 weeks and consisted of a 2 week leaching in running tap water and 4) or one month prechilling. For sterilization after washing with teapol, 10 min immersion in concentrated Cl2+H2O and or HgCl2 0.1%, rinsing 2 times with sterile distilled water followed by 30 sec rinsing with 90% ethanol and finally 3 times rinse with sterile distilled water. This procedure decreases the risk of contamination and facilitates the process of embryo dissection. After sterilization with a manual elimination of the coat, the embryos were excised from surrounding gametophyte tissue, under controlled condition using fine forceps and a scalpel, embryos, cultured in modified MS or WP medium. Culture media and condition: On the basis of experiments using culture media for taxus culture selected, N6, WPM medium supplemented with activated charcoal as the best formulation supporting yew growth (Chee, 1994). Zygotic embryos were cultured on WP mineral basal medium with B5 vitamin supplemented with 2% sucrose and 5 g L-1 activated charcoal and solidified with 0.7% agar. Also it is used modified MS medium supplemented with 100 mg L-1 casein hydrolysate, 1 g L-1 yeast extracts, 100 mg L-1 Ascorbic Acid and 5 g L-1 Activated charcoal. Activated charcoal media were added with 3% sucrose and solidified with 0.8% agar. The pH was adjusted to 5.6 before autoclaving at 121°C for 20 min. Some other embryos were placed in culture tubes with solid medium and incubated at 28°C in continue light for 3 weeks. For each treatment examined the data were recorded. The pH of media was adjusted to 5.8 prior to autoclaving at 121°C for 20 min. The embryos incubated at 26°C in 16 h photoperiod for 2 weeks. For each treatments examined the data were recorded and response or non-response of different treatment group was surveyed. Statistical analyses: For each response measured, data were entered in a contingency table. Germination capacity (GC) is calculated according to GC = (n/N)x100 formula that n is the number of germinated embryo and N is the total number of cultured embryo. The different treatments were compared using the statistical procedure of SAS software programs. Selection media and supplements: The formulation of the basal medium has an effect on the embryos of the yew (Table 1). Between all media and supplemented, the stratified embryos cultured on hormone-free medium of WPM and MS modified medium showed sign of germination within 2 weeks and complete seedlings after 4 weeks whereas the germination frequency of the embryos cultured on N6 without supplement were found to be no statistically significant of germination. This result show that the embryos of Taxus baccata L. is not autotrophic species and need more supplement material. The first noticeable change, observed on MS medium supplemented with 100 mg L-1 casein hydrolysate, 1 g L-1 Yeast extracts, 100 mg L-1 Ascorbic Acid and 5 g L-1 Activated charcoal (Table 1). Also, germination with WP with B5 vitamins supplemented with 5 g L-1 Activated charcoal after an initial process of germination was an arrested growth of seedlings. After 14 days, germination of 20% embryos with both techniques documented that plant regeneration could be achieved from mature zygotic embryos of T. baccata via overcoming seed dormancy. Most embryos had a single, slender primary root with few secondary ones after one month of culture. Germination pattern of taxus embryos: The zygotic embryos of T. baccata were white, intact, torpedo shaped during the first week of incubation (Fig. 1a) and embryos did not growth significantly. After this lag period, the embryos started to germinate precociously an enlarged at the end of 4 weeks (Fig. 1b-d). While swelling of the explants was observed that the surface of these organs was smooth. Then the explants continued to swell and their upper surface developed structures. Both the cotyledon and hypocotyls turned green and radicals had emerged by the end of 5 weeks (Fig. 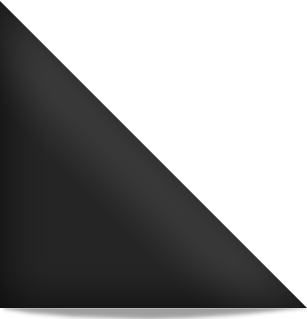 1e). Most seedlings had a single few primary and secondary roots were at the end of 6 weeks of culture. However, root was not satisfactory growth and further work is in progress on transfer of embryo derived plants to green house. Seedling morphology: Germination is epigeal and seeds have two cotyledons with rounded apices, up to 2 cm long with stomata bands above. Three to four opposite pairs of leaves are produced above the cotyledons, followed on vigorous plants by a few alternate leaves around the terminal bud developed from an embryo cultured with 5 g L-1 Activated charcoal. Embryo dormancy is common in the Taxus species. Embryo culture is utilized by pass stratification problems in forest tree species (Ho, 1987). 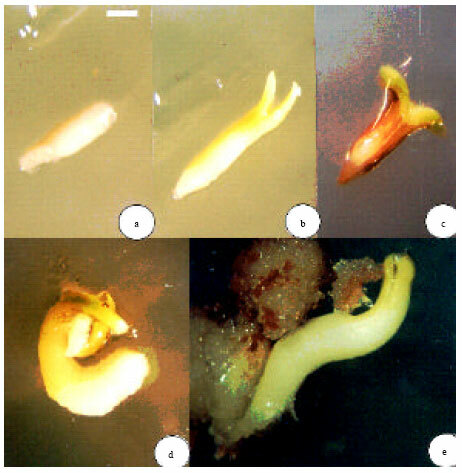 The process of embryo culture of T. baccata appeared to have two stages in germination, included, precocious germination and seedling development. The strong but variability dormancy is attributed to the small immature embryo present when the seed is mature (Thomas and Polwart, 2003). In order to recognize the type of suitable basal medium and supplement for embryo germination, many reports have described the importance of the type and concentration of the basal medium on yew embryo germination. It has also been reported that the embryos from dormant seeds require both leaching and treatment with gibberllic acid or leaching and germination. Also, there is various reported use of medium such a Heller, White/Ms, B5 in Taxus embryo cultures (Jaziri et al., 1996). The germination of zygotic embryos of Taxus baccata was first described by Le Page and Degivry (1970). Germination started ones the endogenus abscisic acid was leached from the mature embryos. Twenty years later Flores and Sgrignoli (1991) used embryos of T. brevifolia and T. media for germination studies. Full seedling developed from approximately 30% of the precociously germinated embryos. A similar germination rate was reported in other Taxus sp (Chee, 1994). Several seed treatment that are caused germination in some species (Hosseini-Nasr and Rashid, 2002) were used, rinsed in the boiling water for 5 and 10 min with soaked in concentrated HCl for 30 and 60 min. Cold incubation in 0°C in refrigerator for 2 weeks. These treatments were found to be no significant of germination. These are documented us deep dormancy of seed. According to this result Chang and Yang (1996) reported that the embryos of Taxus mairei seeds used in study were stored at 4°C within two weeks, so they were still in dormancy. Embryos of mature and immature seeds at different development stages of T. baccata appear to have varied features of color, shape and size. Several authors have made a point of the importance of the developmental stage of the excised embryos of taxus species on germination frequently with the best result from the more mature seeds (Flores and Sgrignoli, 1991; Chee, 1995a, 1994). Seeds of T. baccata consist of two general types of particular kind of dormancy that is known as double dormancy included: 1) Seed coat or external dormancy 2) Internal (endogenous) dormancy. Seed coat (external dormancy) result from a hard seed coat that any process altering the seed coat to make it permeable to water and gases is known as scarification. Following scarification, the seed should be dull in appearance, not deeply pitted or cracked as to damage the embryo and may use with boiling water and or concentrated HCl which is also used to assay Yew seed mantle in our experiment. This way, seed coat nicked or cracked gently with a knife and scalpel. Then embryos were excised that from surrounding gametophyte tissue for embryo culture. The second type of imposed dormancy found in Yew seeds was internal dormancy that seed stratification is needs for overcome this dormancy. There are suggested many case for seed stratification of taxus species. However, the best pretreatment in stratification for germination in our study were one month prechilling or running tap water for 15 days. As a result of all the assays performed with embryo material of T. baccata this proposes a propagation strategy that is useful for genotypes exhibiting different for genotypes exhibiting different behaviors upon culture in vitro. In conclusion, the ability of develop seedling and their qualities depended on the degree of maturation of seeds, basal medium and addenda used corresponding to the some response as precocious embryos. Utility of seed as an explants allow experimentation all the year round and reduces the optimization of many factor such as size, physiological age and orientation of explants which are crucial for the success of regeneration in general and of Taxus species in particular. Therefore the embryo culture technique may provide a quick and reliable method for colonal propagation of T. baccata preserving their genetic diversity. More over, this in vitro technique will serve as a useful tool for the taxane production and biosynthetic studies in T. baccata. We have special thanks for professor Ali Yakhkeshi and Mr. R. Arabali helping us to take samples from the conservation forests. We are grateful to Mrs. T.S. Naraghi, researcher of Research Institute of Forests and Rangelands for offering helpful suggestions and anonymous reviewers for the comments and read carefully our manuscript. Chang, Sh. and J. Yang, 1996. Enhancement of plant formation from embryo cultures of Taxus mairei using suitable culture medium and PVP. Bot. Bull. Acad., 37: 35-40. Chang, Sh., C. Ho, Z. Chen and J. Tsay, 2001. Micro propagation of Taxus mairei from mature trees. Plant Cell Rep., 20: 496-502. Chee, P.P., 1994. In vitro culture of zygotic embryos of Taxus species. HortScience, 29: 695-697. Chee, P.P., 1995. Organogenesis in Taxus brevifolia tissue cultures. Plant Cell Rep., 16: 560-565. Chee, P.P., 1995. Stimulation of adventitious rooting of taxus species. Plant Cell Rep., 14: 753-757. Chee, P.P., 1996. Plant regeneration from somatic embryos of T. brevifolia. Plant Cell Rep., 16: 184-187. Data, M. and S. Jha, 2004. Embryo culture of Taxus wallichiana. J. Plant Biotechnol., 4: 213-219. Enaksha, R.M., 1993. Taxus callus cultures: Initiation, characterization and taxol production. Plant Cell Tissue Organ Cult., 35: 181-193. Flores, H.E. and P.J. Sgrignoli, 1991. In vitro culture and precocious germination of Taxus embryos. In vitro Cell Dev. Boll., 27: 139-142. Gibson, D.M., 1993. Initial and growth of cell lines of Taxus brevifolia (pacific yew). Plant Cell Rep., 12: 479-482. Habibi Kaseb, H. and M.R. Lesani, 1984. Survey to soil condition and yew forest parcel in Iran. J. Iran. Nat. Resour., 39: 13-27 (In Persian). Heit, C.E., 1968. Thirty-five year testing of tree and shrub seed. J. For., 66: 632-633. Ho, C., 2001. Selection breeding propagation and cultivation of Taxus mairei in Taiwan. Handb Taiwan For. Res. Inst., 88: 65-82. Ho, Rh., 1987. Embryo culture specific principles and methods: Growth and development. Cell Tissue Cult. For., 2: 137-167. Jaziri, M., A. Zhiri, Y. Guo and J. Dupont, 1996. Taxus sp. cell tissue and organ cultures as alternative sources for taxoids production: A literature survey. Plant Cell Tissue Organ Cult., 46: 59-75. Le, Page and M.T. Degivry, 1970. Physiologies, acid abscisic in dormancy of embryo of Taxus baccata. L.C.R., Paris, 271: 482-484. Majeda, J.P., 2000. One step more towards taxane production through enhanced Taxus propagation. Plant Cell Rep., 19: 825-830. Mihaljevic, S., I. Bjedov, M. Kovac, D. Lavanic and S. Jelaska, 2002. Effect of explant source and growth regulators on in vitro callus growth of T. baccata L. Washingtonia Food Technol. Biotechnol., 40: 299-303. Mosadegh, A., 2004. Yew tree. J. Environ., 28: 73-84 (In Persian). Naraghi, S., 2002. A protocol to taxus baccata propagation from tissue culture. Forest Pasture Research Inistitute, pp: 63 (In Persian). Rongsen, L., 2004. Enterprise in mountain-specific products in western Sichuan, China. MEI Series No. 9817, pp: 3. Son, Sh., 2000. Large scale growth and taxane production in cell cultures of Taxus cuspidate using a noval bioreactor. Plant Cell Rep., 19: 628-633. Thomas, P.A. and A. Polwart, 2003. Taxus baccata L. J. Ecol., 91: 489-524.